This listing happens to be listed by my company-I saw it today during our office meeting. It’s a grand (well, it once was) two story Edwardian home, the majority of the home is detached. First time on the market in 43 years (and looks it). You can tell it was a great looking home though. 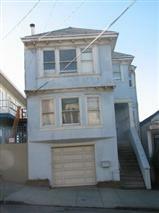 Front exterior of 1471 18th Ave.
1471 18th Ave. (at Judah) listed for $799,000. 3 bedrooms, 2 baths, built in 1911, with parking, on a deep lot (120′). The good news about not much being done to the home, is that a lot of the details are still there. Currently being used as a rooming house and the listing agent states that it will be delivered vacant. Great area, convenient to shopping, public transit and freeways. A blank canvas for you to make your own! Requires special appointments since it is tenant occupied. This is the kind of home that is fun to find because it won’t appeal to everyone! The property is withdrawn from the market.